It’s been a considerable while since I posted here (even by my laggard-ly standards), so I thought I would use the end of the year – and a real kidney stone of a year it’s been, all in all – to reassure any remaining loyal readers* that I have not joined the choir invisible, but am merely lurking. Blame ‘blog fatigue’, among other things. I don’t know how many of these who are still visiting are users of Twitter (anyone care to confess?). Anyway, given my seemingly ever-diminishing attention span, Twitter is probably the best place to follow my abbreviated (if inevitably rather repetitive) rantings. Should you be so inclined, of course. Meanwhile, while wondering what I could possibly write about today, I found myself re-visiting my last year’s predictions for the year ahead. Or rather – what I thought I could predict with a fair degree of certainty would still be true on Dec 31st 2011. When I did this, I was slightly surprised to find that almost all of them were broadly correct. Indeed, some of them were depressingly accurate. Well, not a difficult prediction to make, of course. But I have to say I really am profoundly depressed by what is now being proposed – which seems far too likely to be a form of asset-stripping by the big private multinational Healthcare Cos that have been assiduously dripping their syrup into the ears of politicians of all parties, and their advisers, for the last decade and a half. I was reading this article earlier today, and it was – is – very scary. Getting back to the 2010 year’s end predictions, the major exception to their correctness is the one about Jr Aust #1 losing interest in Harry Potter – though her interest did wane a bit though the Summer, when it was displaced by a taste for the adventure stories of Enid Blyton (sic). However…after we were all compelled to watch some near-interminable programme of Harry Potter movie highlights this afternoon, I think we can conclude that, though Jr Aust #1’s Potter-ism seems to be of the relapsing-remitting type, it is definitely chronic. Talking of the sprogs, I continue to be given regular lessons in Karmic Payback by Jrs Aust #1 and #2. Jr Aust #1 achieved the goal of out-talking dad around the age of four, and for the last couple of years has been out-arguing me too. By out-arguing I mean talking over me, refusing to admit she could ever possibly be wrong, never giving an inch, indulging in casuistry of Jesuitical deviousness, continually shifting the goalposts, and retaining the final sanction of storming out of the room still loudly insisting she is right. Mrs Dr Aust and I continue to hope this prefigures a well-rewarded future as a lawyer. Until earlier today, though, Dr Aust had usually managed not to be verbally outsmarted by Jr Aust #2 (formerly Baby Aust, but as he is now three and a half that doesn’t seem all that appropriate a handle any more). As I was saying – until today. When we were having dinner earlier Jr Aust #2 insisted on doing all his eating whilst lying on his back on his chair with his feet (none too clean feet, I should say) on the table. Naturally I told him to get his feet off the table. I said in my sternest paterfamilias voice. Upon which he lifted his feet until they were hanging some foot or so above the table, in the air, propped on the side of the table. “The Day Dr Aust was Out-Lawyered by BOTH his children”. *The visitor stats do suggest that a few regular remain. For which thanks. In which Dr Aust wishes he could draw, and muses on the changing appearance of the British “-ologist”. A recent conversation with one of my twitter readers, postdoctoral researcher, occasional blogger and one-time co-worker dbaptista, chanced upon the topic of cartoons. Dr Aust has always been fond of cartoons, and I have (another) long backburner-ed book idea involving a compilation of scientific ones. Sadly, my favourite modern cartoonist, the inimitably black / bleak John Callahan, passed away last year, but his cartoons are still with us, and many remain all-time classics. Though I can’t find it online, a series he did on ‘The Hill of Evolution’ stand out for me. Perhaps I will post a couple here if I can find them in book form. As I said on twitter, if I’d actually been able to draw worth a damn, and had been better at thinking up funny lines, I might have fancied being a cartoonist. Which explains, I guess, both my avatar, and the one cartoon that I have published. Though ‘published’ is probably too grand a word; the magazine that printed it is a membership one for the Physiological Society, and the then editor was a friend of mine. And of course I didn’t get a fee. But anyway, in response to dbaptista’s request, I dug it out of the archives – or rather, found it online – and have reproduced it above*. To my amazement, and even rather worryingly, it is a full ten years old. The 1970s scientist is more like the sort of people that I remember seeing around the Oxford University science areas when I was a teenager, and were still common in Universities when I was a student in the 80s (though many of them had trimmed their beards somewhat by then). In the Physiology Department where I did my PhDs in the mid-80s, most of the 40-ish male academics could be seen in older departmental photographs sporting heroically luxuriant 70s facial fuzz. Sir John Sulston is one notable British scientist who keeps this tradition alive. 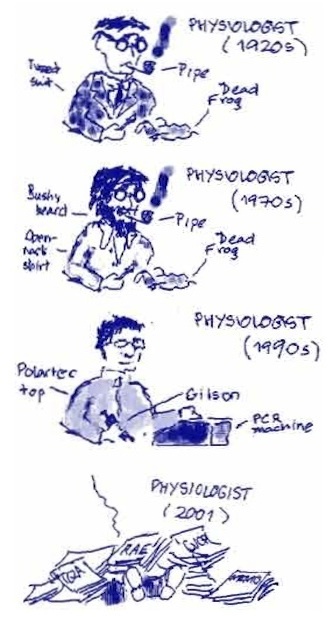 The 1990s figure probably resembles my own generation of cell physiology people, though it would only actually have been me during a rather abortive Sabbatical year doing molecular biology in the late 90s. Most of my experimental work, back when I still used to do some, was with large microscopes in small dark rooms. These bolt-holes had the added advantage of being good for dozing, and for hiding from the students, or from the Head of Department when he wanted to sign you up for his latest scheme. One thing that was (and remains) characteristic of science academics, at least in the North of England, is the triumph of new fabric Polar-fleece type outdoorwear over the traditional woolly jumper; the latter is now only seen on the most old-fashioned among us. If this was how we all felt about the amount of bureaucratic bullsh*t we had to put up with a full ten years ago… how big would that pile of papers be now? *Sorry the image is so poor, but I originally drew the cartoon with the stylus on the drawing programme of the old Psion 5mx palmtop computer (anyone remember those?). Couldn’t find a digital version so I’ve had to cut ‘n’ paste it (with a bit of fiddling) from the online PDF version (see p 22 here). In which Dr Aust ponders language and its obscurities. You lookin' at my bird? One of Dr Aust’s current nightly rituals is reading a bedtime story to one, or both, children. This reminded Dr Aust of an event, over a dozen years ago now, which exemplifies the problems with language (and perhaps also cultural differences) that can turn up unexpectedly in Universities. The story concerns an exam sat by our undergraduate medical students some time in the mid to late 1990s. Back in those days we academics used to, as they say, “invigilate” all the exams ourselves. Nowadays we have special people – often retired academics – who do this, and the word “Invigilate!” instead tends to conjure up for me a vision of someone casting a spell in a Harry Potter book. But in those days, we would be there ourselves to hand out the exam papers and terrify the students with dire announcements about the consequences of cheating, or inadvertently having any notes about your person. Then we would spend a few hours patrolling the exam room trying to look grim and/or spot students with suspect programmable calculators. Next, you need to know what sort of exam it was. This was what we called a “Case paper”, in which the students were presented with a short medical case history. The idea was that they should try and figure out what was going on, first trying to recognise so-called “cues”, and symptoms, in the history, and then suggest what kinds of tests or investigations they would order. Now, you need to know that the word “bird” appeared nowhere in the exam paper, though “budgerigar” was in there several times. Perhaps you can guess what happened next. A student stuck their hand up. Dr Aust hurried over. Students sticking their hands up in exams are not unusual, since requests for extra paper, or to be allowed to visit the toilet facilities, were a regular part of invigilating then and doubtless still are. Of course, a minute or two after the exam started was a little bit early. Dr Aust asked the student what s/he wanted. The student replied nervously “I don’t understand this word”. …And pointed to the word “budgerigar”. “This sentence should help you. Look at this word.“ he said, underlining the word aviary. The student, who judging by appearance and accent was clearly from outside the UK, looked panic-stricken. “I don’t know what that word means either” s/he said. Which is an object lesson, I guess, in being careful what words to use. And in what settings. Especially settings where it is difficult for people to ask clarifying questions. The story does have a happy ending. 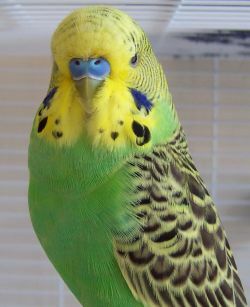 After a few words with the Senior Examiner who had set the paper, we decided to make an announcement to all those in the exam hall to tell them that a budgerigar was a small parrot. It turned out afterwards that several other students had been equally flummoxed by “budgerigar” and “aviary”, though most had not put their hands up. Over the years I have sometimes wondered if any of those flummoxed students, now doubtless many years qualified in medicine and quite possibly GPs and consultants in the NHS, have ever again encountered the words “budgerigar” or “aviary”. PS Mr Polly’s complaint, which I dare say all my medical readers will have guessed, goes by the common name of “Bird Fancier’s Lung”, and is a form of extrinsic allergic alveolitis or hypersensitivity pneumonitis (more here). The joke was that he often did this to people who came from cultures where to admit that you hadn’t understood the Great Man’s pearls of wisdom would be a terrible source of shame, and also a grave slight to the Eminent Professor. Thus the unfortunate subordinate would nod meekly, and the Great Man would depart satisfied that he had got his meaning across. Whereupon Dr Aust and the other more junior lab people would explain to the quivering research assistant what the Prof had been saying. A slightly different problem arises for doctors who work in countries where the language is not their native one. Apart from just the language, they have to cope with regional accents and dialects. In the UK they also have to cope with the British talent for slang and euphemisms. When Mrs Dr Aust first arrived in the UK to work as a junior doctor in a North West England-shire hospital, she was presented with a glossary of “local terms that your patients may use”. The list ran to a fair few printed pages. I suspect it may have had some similarities to the Yorkshire one here, which was discussed by the august British Medical Journal a while back.